When your kids need a dessert and the weather is getting cooler, you’re probably bored of making banana cake or a banana smoothie. 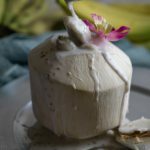 If you got a hand of bananas right now, I recommend you to try one of my fav Thai healthy sweet treat—banana float in coconut milk—in only 15 mins. 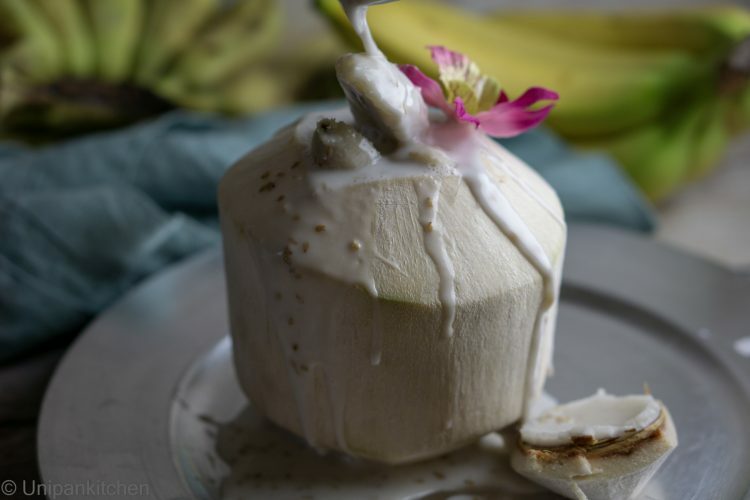 Nearly-ripen banana simmered in thickened warm coconut milk is slightly sweetened with coconut sugar and beautifully presented in a coconut shell. When the banana is not fully ripened yet, it has a hint taste of sourness, so this sweetmeat will have 3 flavors, sweet, salty, and sour. And, once you’ve tried you’ll never forget the silky texture of the sweet-salty milk blended with the soft bananas. Chop the coconut shell open with a clever, save the juice and shovel the meat and set aside. Peel and cut bananas in half lengthwise and bring light-salted water to boil, then drop the bananas and cook them halfway or about 1-2 mins. Set the bananas aside, discard the water. Mix 100% coconut milk and coconut juice, and bring on medium-high, don’t let it bubble. Ladle in the coconut shell and serve warm! In conclusion, this banana float in coconut milk can be a good choice in a cold season. It’s warm and comfortable for all ages. The feeling is smooth, sweet, and sticky on your lips so that you need to polish them off. 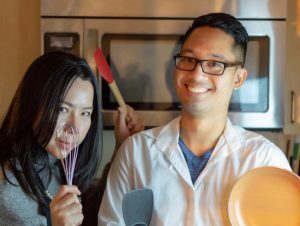 You can replace the dessert with pumpkins, kabocha, or taro if bananas aren’t your favorite. Mix 100% coconut milk and coconut juice 1 cup, and bring on medium-high, don’t let it bubble. Ladle the dessert in the empty coconut shell and serve warm!